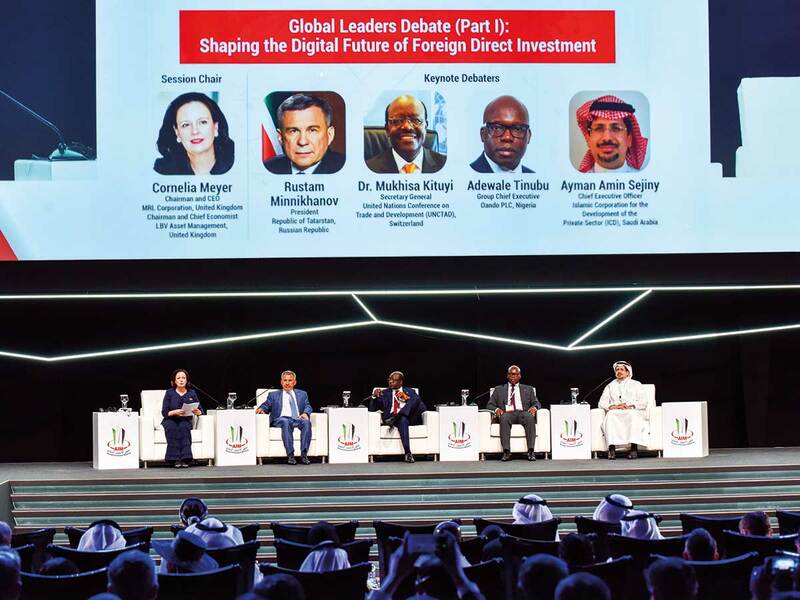 Dubai: A digital revolution is sweeping across the world, changing all aspects of economic activities and no countries can afford to be left behind, said speakers at a plenary session ‘Shaping Digital Future of Foreign Direct Investment’ at the Annual Investment Summit. “Going digital is no longer an option. To get ready for a digital future, nations must invest heavily in education and digital infrastructure that will be key components of knowledge driven economies,” said Rustam Minnikhanov, President of Tatarstan. He said the Russian Federation is investing heavily in universities, software and hardware development in preparation of the fast evolving digital economic opportunities. “The digital future will arrive with massive transformation of job market. Although it need not necessarily mean job losses, there will be fundamental changes in the nature of many jobs available today. The key to this transformation is to prepare the people for it,” Minnikhanov said. Delegates said the future of global manufacturing and trade are going to be driven by digital solutions. “Globalisation of manufacturing and trade are facing fatigue from geopolitics and trade war. This has led to disruption and or slowdown in global trade value chain and decline in return on foreign direct investment (FDI), but the exponential growth in digital trade volumes are expected to drive investments in that direction,” said Dr Mukhisa Kituyi, Secretary-General of the United Nations Conference on Trade and Development (UNCTAD). Globalisation of manufacturing and trade are facing fatigue from geopolitics and trade war. This has led to disruption and or slowdown in global trade value chain and decline in return on FDI. UNCTAD official said digital future is a big opportunity for developing nations to address a number of their economic concerns ranging from economic growth, job creation and distribution. “Preparedness for the digital change is very important. We have been talking about digital divide for a while but there remains a lot of work to be done in developing world to bridging the gap in education and digital infrastructure,” said Kituyi. While the access to information and capability to mine and use big data will be key to unlocking digital opportunities, countries should focus on developing the right skills to tap the full potential of a digital future, according to Ayman Amin Sejiny, CEO of Islamic Corporation for the Development of the Private Sector. “Industrial revolution 4.0 and the global drive towards digitisation will accelerate the speed of global manufacturing and trade making supply chains more efficient and profitable. This will lead to more job creation, but certainly the nature of jobs will change resulting in massive migration of job seekers to new types of opportunities,” said Sejini. The ninth edition of AIM, the world’s biggest FDI platform, carries the theme ‘Mapping the Future of FDI: Enriching World Economies through Digital Globalization,’ this year. Apart from the main conference, AIM this year feature scapacity-building workshops and country presentations, while a special zone called Investors’ Hub will be set up to allow global corporations across multiple sectors meet with official government representatives and project developers.